Russia-backed militants make another attempt to seize Ukrainian positions at the Svitlodarsk bulge – the site of fierce combat actions over the past days. Ceasefire negotiated in Minsk is to come into effect on December 24. At the Svitlodarsk bulge Russia-backed militants do not stop attempts to seize the Ukrainian positions. They launched an offensive under cover of artillery and mortar fire as well as armored vehicles. According to Ukraine’s General Staff militants fired over 100 mines and shells during the combat engagement, however Ukrainian troops repelled the attack, reported Colonel Andriy Lysenko, spokesman of Ukraine’s Defense Ministry on ATO-related issues at a press-briefing at Ukraine Crisis Media Center. “Immediately after the unsuccessful storming occupants opened fire from 152 mm artillery towards residential houses in Myronivka, a village located five kilometers to the north from the combat area at the Svitlodarsk bulge. Later that day the adversary fired twice more upon this near-front village using same large-caliber artillery,” the Colonel added. On the same day combined Russian-militant forces fired heavy weapons near Luhanske two more times, the attacks lasted about three hours in total. Militants fired upon Avdiivka from mortars, grenade launchers of various types as well as from small arms. Russia-backed militants also staged two armed provocations – one near Novhorodske, another one near Verkhyotoretske, both towns are located west of the temporarily occupied Horlivka. In the Mariupol sector a group of eight militant subversives attacked Ukrainian surveillance positions near Vodyane. “The attack was repelled. Adversary incurred losses and retreated,” said the spokesman. At the same time militants decreased the number of ceasefire violations. “Five attacks were registered yesterday. Four of them included the use of mortars. Hostile attacks targeted Ukrainian positions near Krasnohorivka, Starohnativka and Vodyane,” elaborated Colonel Lysenko. Russia-backed militants also fired from small arms near Hnutove. This month for the first time it was absolutely quiet in Shyrokyne. 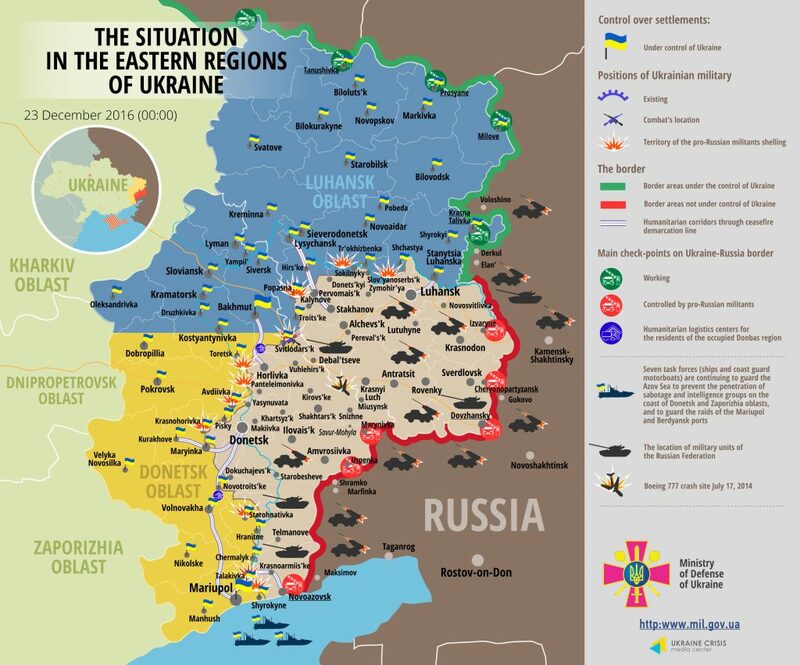 Two Ukrainian servicemen were killed in action over the last day, three more were wounded in action. In the Luhansk sector militants made a series of short-lasting attacks between Zhovte and Krymske as well as in Popasna area. They used mortars once to fire upon Ukrainian positions near Krymske. Colonel Lysenko said that the Trilateral Contact Group reached an agreement in Minsk over the comprehensive, sustainable and permanent ceasefire effective December 24. “In accordance with the Group’s decision on the eve of Christmas and New Year holidays ceasefire should be introduced all along the contact line. The ceasefire will also allow completing repair works so that the residents of near-front towns and villages are supplied with heat, power and water,” he noted. Objects in the repair list include the pumping station of the Luhansk heat power plant, electric power line “Siversky Donets-Donbas” as well as three railway crossings – one near Bakhmutska road and other two on the outskirts of militant-controlled Horlivka. Report on the military developments as of December 22 is available here. Interactive data on the shelling: chronology shelling chart and the interactive map.